The 50/2 Dual Range Summicron is one of the most interesting Leica M lenses with the closest rangefinder coupled focusing of any M lens. 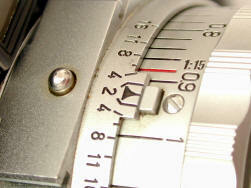 The removable "eyes" provide parallax corrected viewing in the close focus range. 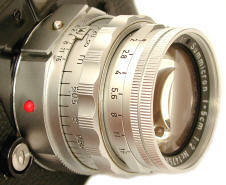 The flat dovetail mounting base for the eyes gives the DR has a unique appearance among Leica lenses. A popular lens in the user market, many photogs consider the DR their sharpest lens. A 50 DR had the honor of having the highest resolution ever tested by the now sorely missed American photography magazine, Modern Photography, at over 100 lines per mm. Using it in the close up range can be confusing, and so the detailed explanation below. If you want to shoot closer than .7 meters with your M camera, the Dual Range Summicron remains your most convenient choice to this day. The eyes must be removed before mounting or dismounting the lens. Left pic shows lens mounted without "eyes" close up attachment in normal focusing range, from infinity to one meter. The eyes will not mount in normal focusing range because the interlocking dovetail mount ball bearing can only be depressed in the close focusing range. Right pic shows close-up of the eyes dovetail mount with the ball bearing. The classic chrome front caps are easy to lose, as well as dent or scratch. Use a modern plastic front cap in the field. Notice the eyes, there is some separation on the larger side, but it is still very usable. 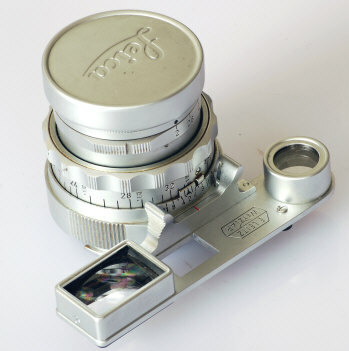 The 50/2 Dual Range Summicron was made from 1956 to 1968, only in chrome. The pics don't adequately show the magnificent fit and finish of the Dual Range. A modern 50/2 Summicron is probably sharper, but side by side, there is no contest on which one is the better made. Until you hold them side by side in your hands, you won't fully appreciate the construction differences of the classic 50's and 60's lenses compared to modern lenses. For Visoflex fans, the focusing head of the DR will unscrew for bellows close up work. 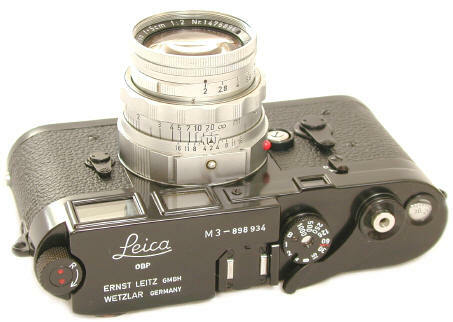 Compatibility: Leica has confirmed that the DR will not mount on all M6, due to internal changes of the film chamber. Try the DR on your M6 before you buy it, if possible. 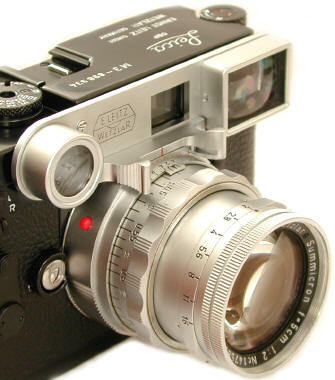 While the DR will mount on the Leica CL, Minolta CLE, the close-up attachment will not line up properly to these camera's viewfinders in the close focusing range. At least some DR's will fit and work fine on the Konica Hexar RF, with its near copy of the Leica M RF/VF. This is the only non Leica M camera that I know of which will allow the DR to work in the close-up focusing range. The DR will NOT mount on any digital Leica M8/8.2/9/10 that I have tried. Something about the lens mount is not the same as most Leica M lenses. Unlike most Leica rangefinder 50mm lenses, the lens head of the Dual Range unscrews for use for close-ups on the Leica Visoflex system. This is the first version with E. Leitz enlarger condenser logo on the close up eyes. Earlier DR's have a single feet or meter focusing scale, and clip on eyes with the E. Leitz enlarger condenser logo, as shown on the top photo of this page, and focus to 19." 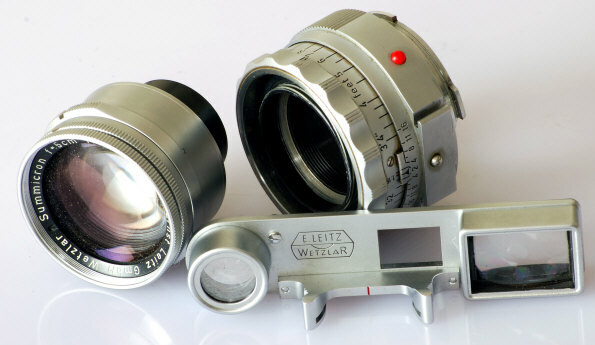 Later DR's have a dual feet and meter focusing scale, with a simpler Leitz logo, and focus to 20." The optics in both versions are generally believed to be identical. There may well be other variations as well. As pointed out to me by Leica expert Marvin Moss, the ball bearing mount on the earlier lenses is larger than on the later lenses. This results in the earlier close up attachment with the Leitz condenser logo fitting on later lenses, but not vice versa. If you plan to buy a Dual Range, there are a few things to look for: The DR's soft lens coating scratches easily. The Leica glass of the period often gains a bit of haziness with the years. Shine a light through the lens from both ends. 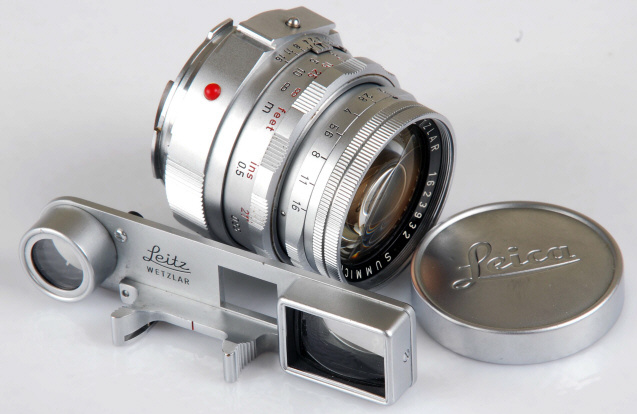 If fogged, the lens should be disassembled and cleaned by your Leica repairman. If you find a lot of scratches, don't buy it since recoating is expensive and takes a true expert. DR's often are sold without the close up attachment eyes. 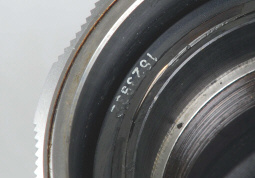 If your focusing helical has a serial number engraved, make sure it matches the serial number of the lens head. Finding the correct eyes for sale may take a lot of looking. Remember the 1st and 2nd versions don't mount the same eyes. Separation in the eyes is not that unusual, but seldom is the viewing affected, and of course there is no effect on the pictures- but it lowers value of the eyes by 50%. A nice little leather case was made for the eyes, and is hard to find only if you are looking for it. The DR takes standard Leica 39mm filters. My favorite DR hood is the versatile multi-purpose vented hood # 12585, which also thankfully fits the pre-ASPH 35/2 Summicron, the 35/3.5 and 35/2.8 Summaron, the 50/2 Summicron, the 50/2.8 Elmar (classic version), 90/2.8 Tele-Elmarit, 90/2.8 Elmarit, 90/4 Elmar, 135/4 Elmar and 135/4.5 Hektor. The proper vintage front cap is beautifully finished chrome with an embossed Leica script. Unfortunately the pretty classic chrome caps are easy to lose, so I suggest using a modern plastic front cap in the field. 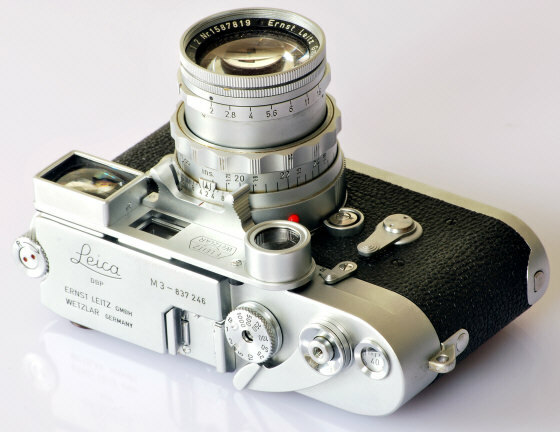 Today the 50/2 Dual Range Summicron remains unique in the Leica M system, a favorite of users and collectors alike. Revised: June 12, 2012 . Copyright � 1998-2012 Stephen Gandy. All rights reserved. This means you may NOT copy and re-use the text or the pictures in ANY other internet or printed publication of ANY kind. Information in this document is subject to change without notice. Other products and companies referred to herein are trademarks or registered trademarks of their respective companies or mark holders.